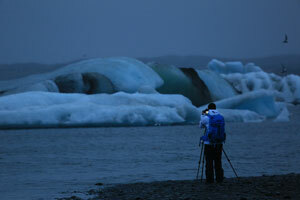 Iceland is one of those mystical place for photography. 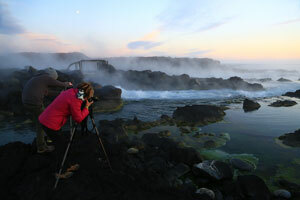 Over the past 5 years everyone with a camera has seen the shots, not knowing where the locations are, and then assembled this bucket list and then once they find out all of those shots are in the same country they plan their trip. 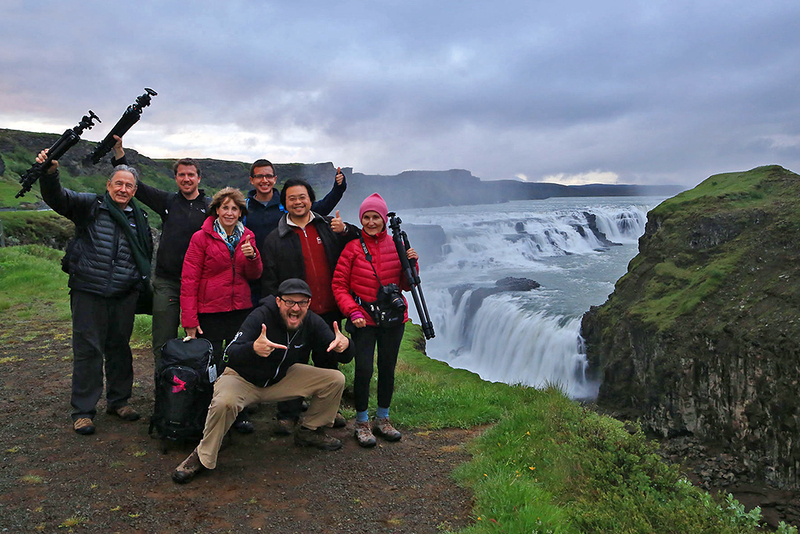 My goal as a tour leader is to try and bring a group to as many of those scenic locations as I can, as well as a few off the beaten path locations within a 10-day time frame. 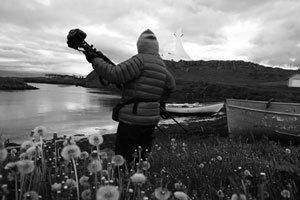 While many people have an idea of what to expect when it comes to the places they'll shoot...they have no real way to plan for the schedule, and the endless light that comes with a trip to Iceland. This is part of the adventure I really enjoy the most. 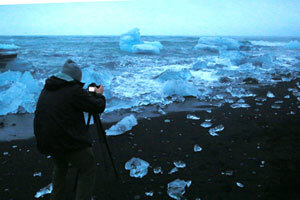 It's a challenge to photograph Iceland. 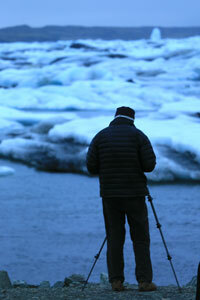 It pushes not only the creativity of the photographer, but also the stamina and the endurance. Everyone arrived with no problem, and after a little rest in the hotel we met for a brief orientation before setting out to downtown Reykjavik for some good old fashioned fish and chips...the food is some of the freshest and best in the city, and everyone had a full belly and happy face when we left. These first meals are great because everyone has their full energy level, and the enthusiasm levels run high...everyone is ready to get into the fold and go shoot the light. 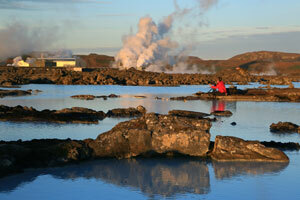 Our first stop was a relaxing visit the the world famous Blue Lagoon. THis pool of geothermal run off has become a must see spot for everyone who visits this country whether it's for 1 day or 2 weeks. 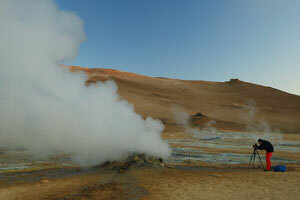 Our group braved the challenges of the changing stations and met inside the pleasantly warm hot pool. After the group purchased a beverage of their choice, we raised a glass and made a toast to 10 days of good light and good fun. THe pool was quite relaxing and the group had fun soaking in the mineral rich water, and putting some of the grey lava mud on our faces so that we could look the part...and also have soft supple skin when we emerged from the pool a couple hours later. The pool was bustling with participants in a local bike marathon, and it provided a little entertainment to the experience. A Live DJ played some relaxing tunes as the masses soaked and swayed in the blue colored water. When we left the pool our first shooting location was literally right outside the doors of the facility. 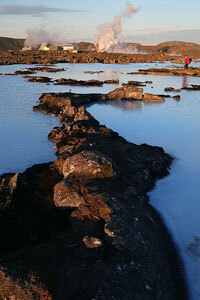 There are numerous walking paths through the black rock lava fields interspersed by rivers and pools of blue geothermal run off. 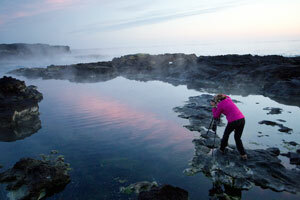 The water in these pools is not heated, so it means no bathers, and perfect spots for grabbing interesting photos. I helped the class with compositions, some basic camera settings, and watched as they joyously meandered the area looking for their own take on this popular icon. Our second stop of the night was one of those off the beaten path places...there's a smaller geothermal plant that has tubes letting out massive quantities of geothermal heated water directly into the ocean. 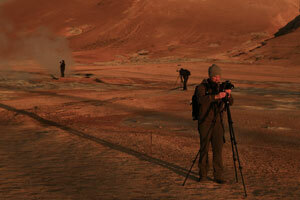 where the water meets the sea, steam rises and created an otherworldly almost alien landscape. OUr group moved carefully through the rocks and found some great compositions that had reflections of the bits of sky color, and also hints of the greens and red colors of the plants that grow in this strange environment. 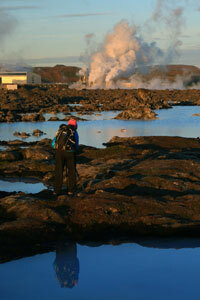 Black lava, blue geothermal water, and brightly colored algae...how cool is that! 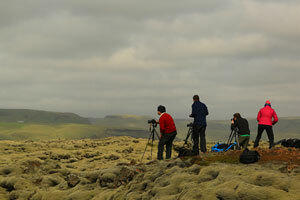 Everyone came away with some nice work, and had fun seeing some part of ICeland that most don't even know exists. 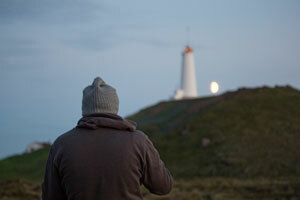 On our way back towards Reykjavik I noticed the nearly full moon rising behind the local lighthouse, and we stopped to grab some moody shots of this as it happened. We used telephoto lenses to capture the moon, and make it appear larger when compressed with the lighthouse...they were sleek, simple compositions, but pretty and effective as well. Because most people had arrived early that day, and waited for the rooms to be ready for check in...most were tired, and in need of some sleep...so we made our way back to Reykjavik so they could get a little rest before we departed into the mainland of the country. THose who were up for more adventure joined me as we photographed some great color over the Hallgrímskirkja, a very modern cathedral in central Reykjavik. There were some great orange flowers growing around the church, and I encouraged the photographers to use them as a foreground to balance the color in the sky, it was also a chance to briefly discuss focal blending in images...depending on the closeness of the foreground in the image. 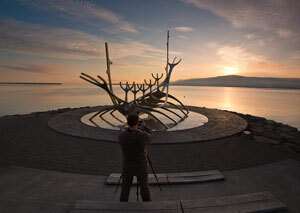 When the shooting at the cathedral was done we walked down to the bay to shoot the famous viking boat sculpture, Solfar, which means sun voyager...appropriate to the name we watched as the sun rose over the mountains, and the guys shooting got some nice sun-stars with the boat in the foreground. PERFECT! 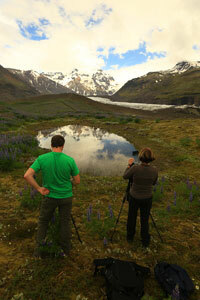 We stayed in the beautiful Hotel Skaftafell, situated right at the edge of Skaftafell National Park. 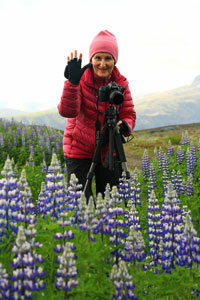 OUr hotel was surrounded by beautiful Lupine fields, and a view of some of Icelands tallest glacier capped peaks. WHen we arrived the clouds were great, and I encouraged everyone to drop off their bags and head up behind the hotel to shoot. Using the fields of lupine, and a few small tarns as foreground this spot proved to be one of the small rarely seen spots we photogrphed in the country. I helped people find some great angles, tweaked some compositions, and helped answer a few minor setting questions. 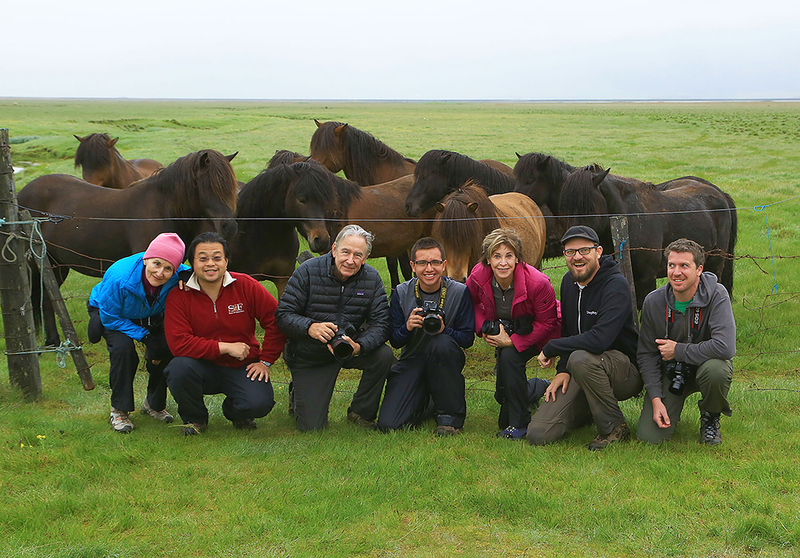 This was a savvy group, and I liked the enthusiasm they brought to this spot and each we visited throughout the trip. They all wanted to get the best they could and made the most of each chance. The hiking post says 1.5K to the waterfall...but 1/4 of the way into the hike the sign says 1.7K to the waterfall...we just agreed it was about 524 miles there and back, because at times that's what it felt like. It's not an easy uphill hike to the falls...but everyone made it and did fantastically. 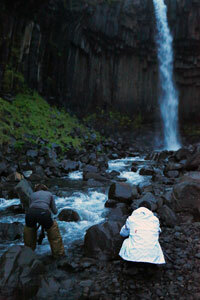 Once there we shot this beautiful waterfall framed with basalt columns. A few people used my wading covers (which may or may not have a leak in them) and got right into the river to get some up close and personal shots of the river. Slower shutter speeds here made for some dreamy water movement. 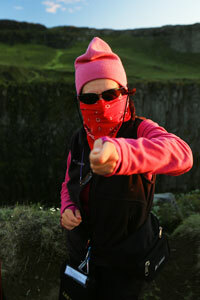 On our hike home we enjoyed the company of one another, laughed and joked, and were refreshed by the cool evening air. The trails in the National Parks are pristine, and the foliage is beautiful here and much thicker because sheep grazing is forbidden inside the boundaries, allowing the small trees and brush to grow to their full potential. When we arrived back at the hotel, most people were ready for a good, well deserved nights rest...but those who were hungry for more waited up to see if the morning light would bring us any sweetness behind the hotel...and luckily our wait was rewarded with some nice reflections in the tarns, and low wind to shoot those fields of beautiful purple lupine....what a full and rewarding day. The next day a few of us hiked out to the edge of the glacier and marveled at the different textures and shapes in this living piece of ice. 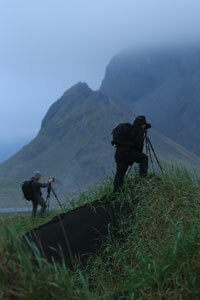 That night we set off for a little town of Hofn, where we ate a fantastic dinner, photographed some beautiful Icelandic horses in s a field near an old ruined farmhouse...and set out to the little bay of Stokknes, where we had a view of the eastern fjords, and found a really great little scene with tongues of fog lapping over the jagged peaks, over a bay with cracked mud and reflective pools....It wasn't colorful, but often Iceland is moody and dark...and these shots really lent themselves well for monochrome treatments. 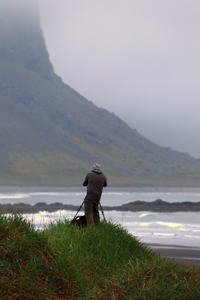 I saw some truly stunning work on those camera screens...Iceland is great that nearly any road you drive on, if explored fully will yield some successful images. With the odd sleep schedules and never-ending light 3 days seems like 60 and everyone went to bed that night not knowing if they had eaten lunch, or dinner, or when they last slept, or what day it was....HOORAY ICELAND! 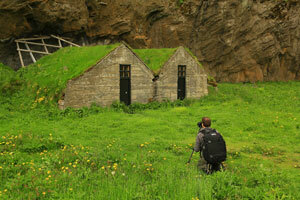 Today we began to work back west to the tiny town of Hella. 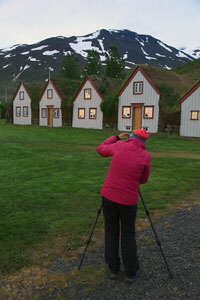 We made a lunch stop in the coastal town of Vik, where we shot the little red-roofed church, and some of the changing afternoon light. 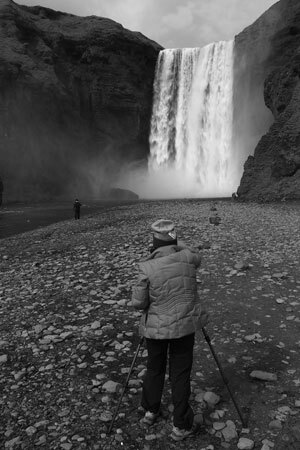 We also made a stop at Skogafoss...a large curtain falls that has been in numerous movies, and seen in postcard like shots all over the world. The light was dappled and nice, and I encouraged those with ND filters to use them to get longer exposures, and we used the lines of the river as a leading line into the giant waterfall. 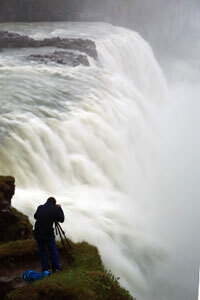 This falls also has a lot of opportunity for closer up shots of the details, and using a person as scale for truly how big this waterfall is. 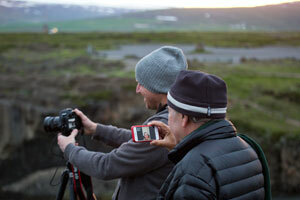 That night we set out to photograph Seljandsfoss...one of the more popular photography stops. 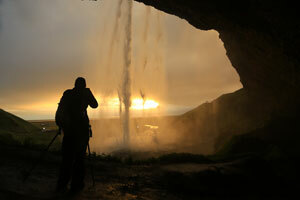 This giant waterfall has a path that lets you walk behind the waterfall and shoot back outwards, and in this case, we were lucky that we had some nice cloud color, and a chance to photograph the setting sun on the horizon. 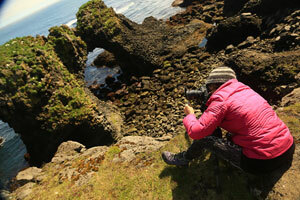 I saw a couple REALLY stunning shots of this location. 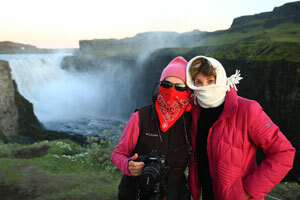 While normally very misty, the wind was in our favor making shooting from behind the falls quite manageable. High, low, behind, in front...we shot this waterfall from all angles...and made sure that when we drove away we had it all...Except Winston. 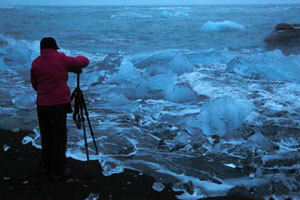 He wanted to wait to see what the sunrise light would bring, so we left him to his spot and drove off back towards Vik. 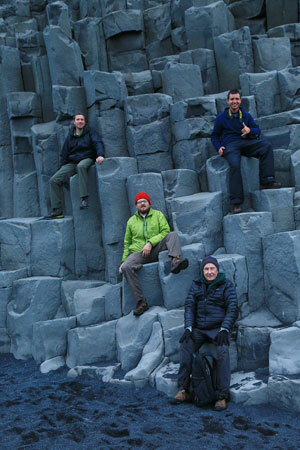 The rest of use walked out to the black sand beaches near Vik to Photograph the basalt columns, and parts of the rock formation Reynisdrangar. This eerie rock formation is said to be the remains of a giant troll who was towing a shop ashore one morning, and was turned to stone by the rising sun. Whatever it is, it's a heck of a lot of fun to photograph. We switched to black and white modes to really complement the moody sky, and accentuate the contrast with black sand beach and stark white waves. We experimented with different exposure times here as well...some to make use of the details in the waves, other longer to really smooth the water and create a more dreamlike scene. We made one more stop at a little turn out with an old abandoned farm house, some cool creek curves, and a oddly shaped mountain in the back....they were fun to see in black and white, and were a good place to help teach about depth of field and focusing on the flowers and not the church, and also using the curves of the creek as leading elements, and foreground interest. Once we had all of these images, it was time to head back and check on Winston...although he said he was attacked by the waterfall at one point, and his wet hair confirmed his statements, he seemed no worse for the wear and we quickly loaded him up and set off for the hotel where we enjoyed another well deserved night of rest. 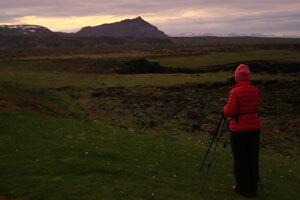 For these nights we stayed at the beautiful Skjaldarvik Guesthouse. 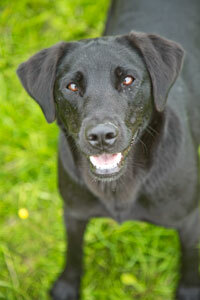 This lovely farmhouse is run by Oli and his beautiful family. THey work hard to make a luxurious setting in the middle of the country. 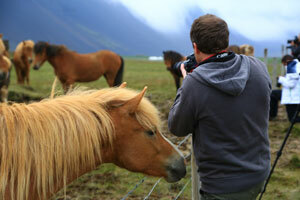 HE runs a working farm so the whole premises is surrounded by beautiful Icelandic horses that are great models for photographing during down time. 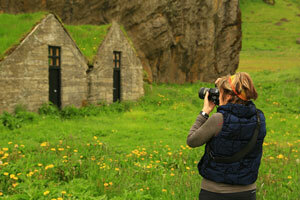 This place is located close to a major town, and also several iconic locations for photographing. 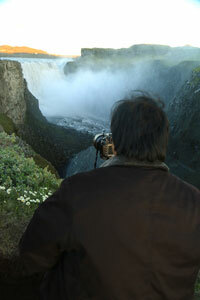 Our first night we shot the waterfall Godafoss...or waterfall of the Gods. This horseshoe shaped falls has several vantage points to shoot from, and also had thew potential of getting some color in the sky. We moved high and low, and I helped everyone get dialed in with some compositions, and then we waited for the color. THe color didn't come over the falls...but people still got some awfully nice moody monochrome images...and there was some color in the oppositie directions so we shot some images of the river with the bridge in the background, and a stunning, intense sunset (or maybe it was sunrise?) We used the edges of the river bank as leading lines, and the nice blue river water wa sa great point of interest as it snaked down the frame towards the colorful sky on the horizon. 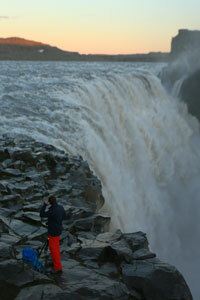 Our second night we drove out to Dettifoss, the most powerful waterfall in Europe. THis falls absolutely ROARS...it's so big that it's constantly murky brown with silt...which makes it great for black and white images....all the clouds from the previous days vanished leaving us with flat salmon colored skies. THese skies were perfect for the full moon that rose slightly off center to this waterfall. 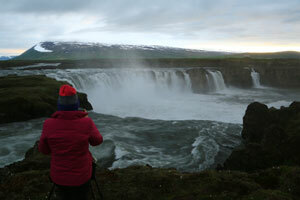 Giant waterfall, full moon, no mist....what could make it better. A ton of flies! 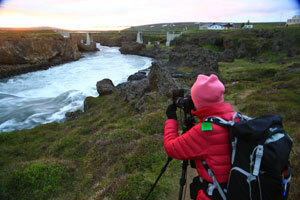 The nice Icelandic weather brought out the midges, which are non-biting, annoying flies. Everyone handled them with a sense of humor, and once the sun vanished most of the flies did as well, and we were able to shoot without the risk of eating a fly. 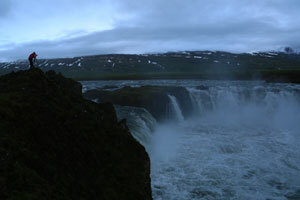 From Dettifoss we drove south to the Geothermal area, Namaskard. This area is filled with cracks, curves, sulphur pits, steam vents, and all sorts of interesting textures, shapes, and smells. 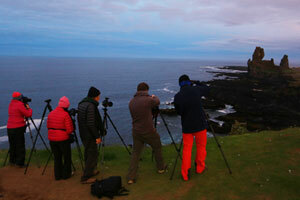 THere was a nice glow in the sky and everyone set off to find their favorite shot. 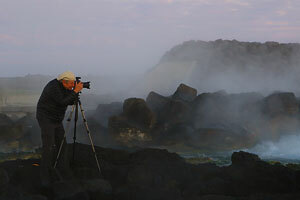 I encouraged people to use a combination of mud pots, and steam vents to fill the frame and experiment with different shutter speeds to blur the steam or create a smooth flow. 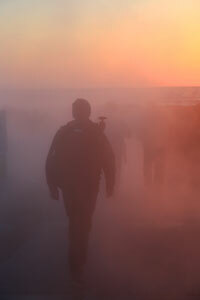 We shot this are until the sun was up and too harsh to continue...but man did they get some great images! Our last night in Akureyri, we drove out to Hvitserkur, a rock often called "the dinosaur rock" which in my opinion looks nothing like a dinosaur, but whatever....we scaled a small cliff to the bottom where we hoped we would see signs of an afternoon storm that rolled in breaking up...but it seemed to be getting more intense, not less...so we worked on longer exposures, and using the interesting rock shapes for foreground...though these shots lacked a lot of color, the soft moody feel was really nice for a lot of folks. 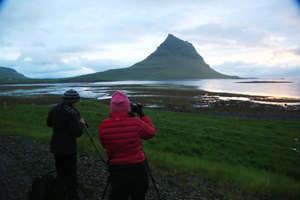 We returned to our lovely hotel for one final rest before we woke and set off south for the Snaefellsness Peninsula, and two nights of coastal living in the tiny fishing village of Grundarfjordur. 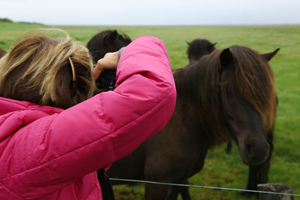 Grundarfjordur is situated perfectly near the majestic Kirkjufell mountain, which is a coveted shooting location for landscape photographers world wide. After a rest and nice dinner our group set out for this mountain and were greeted by lovely reflections in the nearby pools....and some of the students stopped to get some of these great images utilizing their polarizing filters to help bring out those reflections. 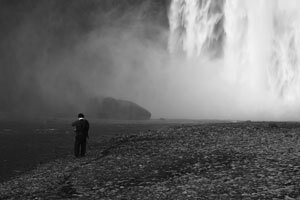 The other shots here that are very popular use the nearby Krikjufellsfoss waterfall that helps create some dynamic juxtaposition between land and water. Our group procured some of the better spots along the ledge and were treated to some great bits of pink in the textured sky...I saw so many nice compositions here...which was awesome considering how much people like to shoot this waterfall. 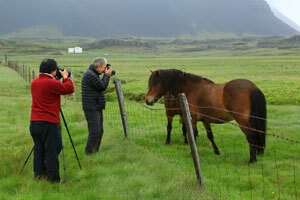 I helped point out some minor composition tips to the group, but by this point they were all really getting along well with finding their shots, and executing them perfectly. An intense photo bender like this really helps photographers hone their skills, and get more dialed in with the shots they want to create. The light was changing so we moved out to the tiny church outside the town of Hellnar that has a beautiful view of the nearby Snaefellsjokull glacier...which is famous for being the entrance in the book 'Journey to the Center of the Earth' We used compression with larger lenses to make the church and nearby mountains appear closer together. 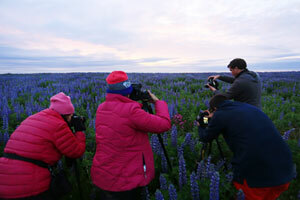 The church was also close to some great lupine fields which allowed for some nice compositions utilizing a wonderful pink sunset sky that followed us throughout the night. Lots to shoot here and the group immersed themselves in the flower fields and got some great images...we even found a bushel of bright pink flowers that helped mimic the colors in the sky and give a blast of color to these images....such a fun spot. 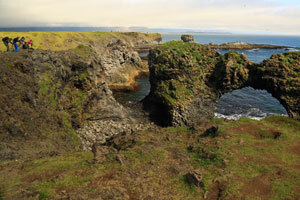 Next we headed to the Londragnar sea stacks and shot them from a small perch on a cliffside that looked up the coastline to these club shaped stone monoliths. We used the awesome surrounding cliffside as a frame for the image and everyone made some really nice shots horizontally and vertically using the seastacks, foreground elements, and nice long exposures to bring out the blues in the water. 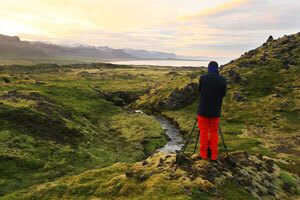 The sky was becoming quite nice so we drove up a dirt road and had a fantastic view over the vibrantly colored moss lined lava fields over the fjords and off to the snow capped mountains. 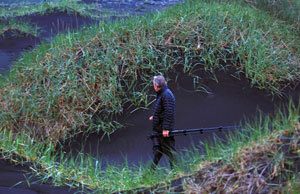 A small creek gave us a perfect leading line and everyone got some amazing, shots that screamed, THIS IS ICELAND, and were those type of shots not normally seen by the masses....having these types of images to counterbalance the icons really makes a portfolio impressive. 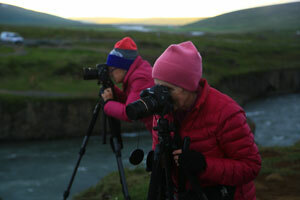 After six hours of continuous shooting good light, we were wiped out and made our way back to the hotel for some much earned rest...along the drive we spotted two arctic fox scampering about in search of a night snack. THese little creatures are elusive and we managed to spot 3 of them during our class...none stuck around long enough for their picture to be taken, but just seeing them is a nice bit of luck! 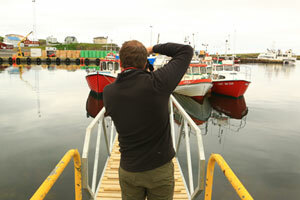 The next day we headed back out and begun in the tiny fishing town of Stykkisholmur. 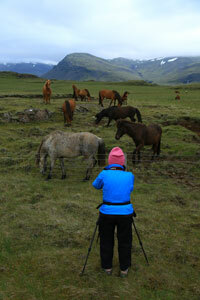 This town was used in the filming of the movie, 'The Secret Life of Walter Mitty." We shot the iconic and oddly shaped church there, and our luck was great because we found one of the only holes in the sky that night, giving us some nice subtle color. From the top of hill we moved to a tiny inlet where we found a couple old fishing boats that made for a nice foreground with the church in the background...in my opinion these shots were tremendous and much more aesthetically pleasing than those normally made from the top of the hill. THe light was great as well giving people a chance to either use monochrome or color to display this image. From this church we moved to Budir, the tiny black and white church from the 1800s...this church is an icon of the peninsula, and though we had some murky weather we made the most of the scene and worked to get some nice black and white images using the stone wall as a foreground and leading line...some wet foliage also added some depth and interest to these pictures. From there the drizzle came in hard and we ran away tails between legs looking for another spot that had great light...and luckily for us we found it. A small abandoned farm sits on a spit of verdant green on the edge of the peninsula, and we managed to find a way to use this building with the peaks behind it and the sunset as well...the hill and church we chose to leave silhouetted and use the color in the sky and ocean as our interest points...we used our longer lenses to give some compression and make some more non-iconic type images....what is awesome about Iceland is that nobody is out shooting at these hours, and we literally could park in the middle of the road and shoot and not have another soul around. THe light was fleeting and the storm we had outrun previously found us again and it was time to pack it in and head back to the hotel. 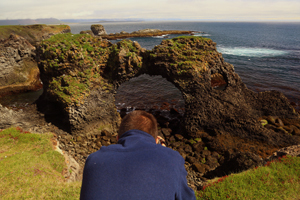 Back to Reykjavik...we made a brief stop in the town of Arnastapi to shoot the sea cliffs and the tiny sea arch there. 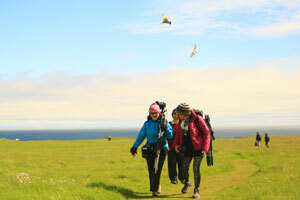 Everyone braved attacks from the territorial arctic terns and made it to the cliffs without injury. The rain from the previous day was gone and a blue sky with white streaking clouds was there to greet us. 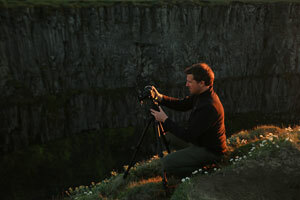 Everyone did great managing the cliff edges and came away with a few nice shots of this little section of the coast before we settled in to the drive and returned to Reykjavik for our final night of shooting. 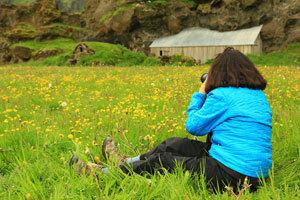 After a nice dinner at a local Indian restaurant, we set off for our last shoot. 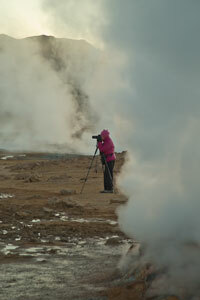 We begun in the little town of Geysir, where we photographed...you guessed it, a geyser! 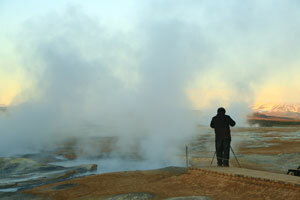 The geyser strokkar is nice in that it erupts every 5-10 minutes so nobody has to wait too long to get a shot at capturing that magical blue bubble of geo-thermal soup before it explodes 30-40 feet in the sky and sends steam and spray everywhere. I think by this point the group was getting a little punch drunk from all the long nights, everyone hooted and hollered as each blast from the geyser erupted. "I got the blue bubble!" was what we all wanted to say, and everyone was able to say that by the end....the settings here were a bit tricky, and everyone seamlessly moved from single shot mode to continuous rapid fire mode to capture the whole event from blue bubble to 40 foot tall geyser. 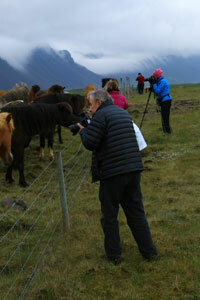 The sky was changing rapidly and we hurried down the road to the mighty Gullfoss. 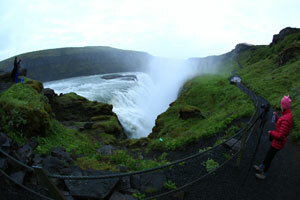 This waterfall is a main stopping point on the popular tourist 'Golden Circle' route. 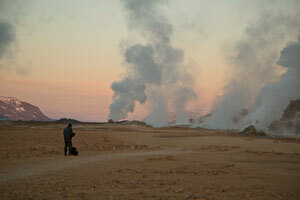 When we visited it at midnight, we had it nearly to ourselves. We shot from the top first, and a few hints of pink were filtering through the mist...we all grabbed a few shots from this main vantage point before working down lower to get shots looking up the canyon. 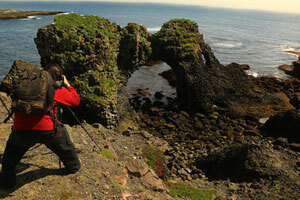 Here we framed the shots with the curves of green moss that surrounds the falls. This waterfall is beautiful and has a more green color to the water, rather than the dirty brown other large waterfalls like Dettifoss have. THe longer we stayed the better the light got, and before we left everyone got a few more images from the top again before heading out. Our last stop was a small dirt road with a view over the mountains, a low morning fog had crept in the valley and presented us with a chance to capture fog, mountains, and sunset all at once. I pointed out some great flower patches to use as a foreground in this otherwise desolate tundra, and everyone worked on getting low and capturing some nice shots of this. While we were there, conditions went from foggy to no fog, to overly foggy, and then back to normal fog...all wihtin a forty minute span. 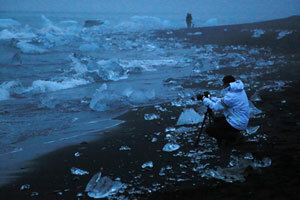 THat's why the Icelandic saying goes, "If you don't like the weather, just wait fifteen minutes." I must say this group was great...everyone handled the crazy schedule with grace and class, nobody snapped, and everyone got some tremendous work in their cameras. Though two people had to catch a 6am ride to the airport, they still manned up and stayed on the light until 4am. That's some serious dedication! It's always sad to see a class like this come to a close...everyone has bonded, and the group becomes almost its own organism...I enjoyed getting to know everyone a great deal, and watching them as they became so good with the settings, and got so much better finding compositions, and utilizing all the tricks and filters needed to get their own vision of these magnificent locations. By the end I barely had to offer any suggestions on compositional tips, and people were firing off amazing shots left and right. Though everyone was tired, and I think glad to be returning to a normal schedule, I'm really proud of each and every one of them and all they endured to make the most of this trip. This is not a journey for the weak of heart...and EVERYONE hammered this out with flying colors EACH and every time...such a fun bunch of people. I'll miss them all a great deal. My next class will arrive in 2 short days, and they'll have their work cut out for them to keep the pace and magic that this group had alive and well. 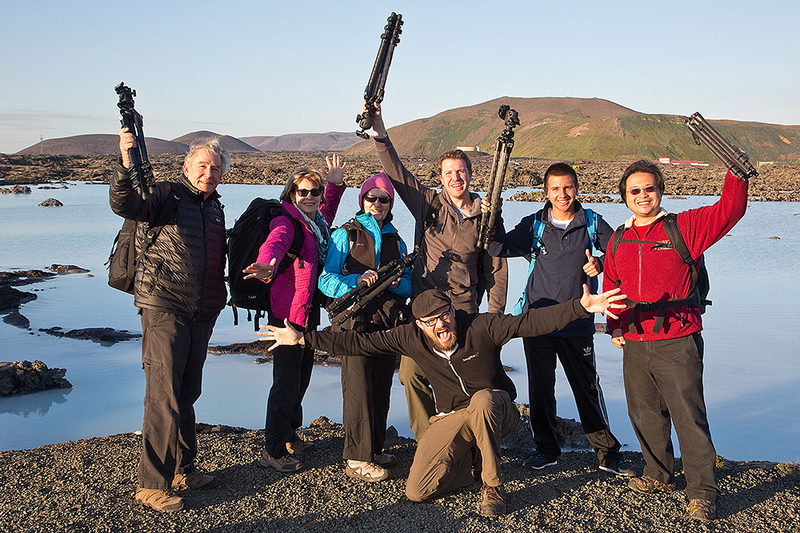 To James, John, Mario, Winston, Ruth, and Lynda I thank you all so much for a fun 10 nights of chasing light in Iceland. I'm looking forward to seeing all of your finished images and reliving all of these memories for years to come through your eyes.